Like many things in life, we don’t tend to give our eyes an awful lot of thought. After all, they just sit there don’t they?! However, if you were to take a minute to actually think about how they work and protect us, I guarantee you would be amazed – at least 540 million years of evolution has gone into perfecting our eyesight, and the processes involved are breathtaking. Isn’t it amazing that we have the ability to see specks of dust and planets millions of miles away?! The average weight of an adult human eye is 7.5 grams, slightly more than a tablespoon of coffee! From the moment of birth, our eyeballs grow rapidly, enabling some children to have 20/20 vision by just 6 months old! Eyeball growth reaches a peak at around 13 years of age, and during this whole process, the eyeball has change size from birth dimensions of 1.6cm up to the 2.4cm seen in adulthood. As we humans are predators, our eyes are situated at the front of our heads – perfect for assessing landscape depth when looking for prey. This is in stark contrast to the prey themselves! Look at any rabbit, deer, or fish and you will notice that their eyes are on the side of their head; giving them much needed panoramic vision to spot any cunning hunters. Fun facts to one side, the real magic happens in how our eyes function. 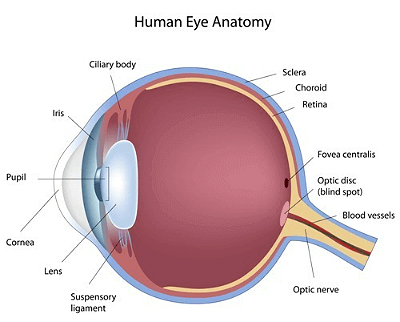 Millions of cells and nerves combine to elicit the miracle that is human sight. Light enters our eyes through our pupils (the ever changing black circle at the front of the eyeball). The reason for this continuous size adjustment is the controlling mechanism of our iris, whose role it is to regulate light – by changing pupil size it prevents damage to the eyes by safely letting more or less light in. Once the light has been regulated, it passes through the lens and focuses on the retina. Depending on what our eyes are looking at (close up or far away objects), the lens changes shape to keep the light perfectly focused. The final stage happens when our Retinas convert light into electrical impulses that send messages to our brain. If this process is not followed perfectly, we encounter vision problems. Both long-sightedness and short-sightedness are a consequence of light not focusing accurately on the retina. Maintenance is very important! In order for us to see clearly, our eyes need to be regularly cleaned. Luckily, we have a built-in, super-effective washing mechanism called tears! Naturally salty tears act as an anti-bacterial disinfectant for the eyes, flushing out any foreign objects and germs that may have accumulated. Muscle control is also a crucial factor. Six muscles surround the eyes, and by exerting tension in unison, they help to give us an astounding amount of visual capability. Be honest – do you know any of their names or have you even thought about them before? It is not for nothing that the eyes are known as ‘the windows to the soul’. Subtle changes in their appearance can reveal our thoughts and emotions at any given time. They also often dictate our mood – sending images and messages to the brain that alter our behaviour. Did you know that our eyes give us 55% of our emotions and thoughts? They detect small changes in the attitude and body language of other people, which in turn change our own thoughts and reactions. They can betray our personal feelings to others – narrowed eyes often indicate sadness, while open or wide eyes can signal surprise or anger. They also show when we are feeling unsociable. Looking down or not maintaining focus could mean somebody is lacking interest or feeling bored. We hope that by reading this article, you can now appreciate how our eyesight affects all our life actions, and why it is so important to look after and cherish your vision.